This means 9 of your 10 best clients, and prospects, probably do so too. While it may seem like a threat, we see it as an opportunity. If you proactively collect feedback and reviews with FirmChecker, you can (1) refresh your service offerings so you're giving clients what they want, and (2) demonstrate to your prospects that you care what your clients think. 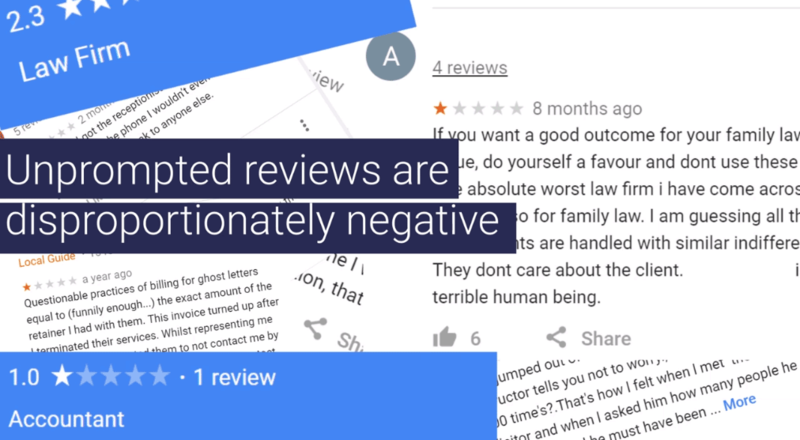 When you make it hard for your clients to leave a review, they'll tend to do so only when angry. Proactive use of FirmChecker makes it easy for clients to leave reviews, reducing negative skew. We give clients the option of providing private feedback or leaving reviews publicly. Our reviews are designed for professional services. They provide more nuance than clients venting their spleen on Twitter or summing up your entire business with just a  or . FirmChecker offers easy feedback and reputation management. Collect authentic reviews. Clients can leave reviews or provide private feedback to resolve issues. Get feedback fast. Monitor and adapt to client feedback in real time. Showcase your experience. Our data visualisation shows prospective clients that you have real experience in practice areas they need. Get recognised. Subscribers automatically go into the running for the NAB Professional Services Awards. Capture targeted leads. Capitalise on your online reputation with our booking engine. Clients are increasingly looking to data to inform their decisions. Help them. Kickstart your presence on FirmChecker by using our secure feedback portal. We independently audit your clients' satisfaction while maintaining their confidentiality. Once this is complete, we provide a phone consultation to help you interpret and action your survey results. If you're happy, we'll help you use them to hit the ground running. If not, we'll identify key areas for improvement to ensure your reviews are better in future. This way, your mind can be at ease knowing your clients are happy before you get started.